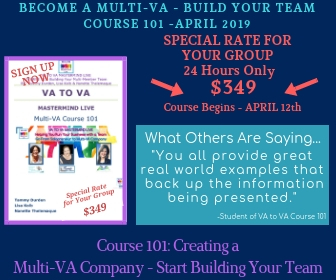 This course is designed for solopreneur Virtual Assistants looking to bring their business to the next level by hiring a team of other Virtual Assistants with skills in specific niches they don't have. This allows solo Virtual Assistants to scale up their business, open new markets and reach more clients and gain more revenue. Agreements & More. TONS OF INFO & RESOURCES INCLUDED! Team building is one of the biggest challenges a growing VA business will face. Getting it right can produce impeccable results, getting it wrong can cause disaster. If your goal is to create and manage a team of virtual assistants, the list of things to do in order to make that happen SUCCESSFULLY can be long and overwhelming. Wouldn’t it be great to get advice from those who have successfully done it already or in the process of doing it NOW? If you want more revenue you need to be bold and take risks. If you are to grow and for your business expand, you need to invest in yourself. This course is an investment in more revenue and more opportunities. What is that worth to you?